Provident Group’s imperial residential launch – The Provident Equinox is a haven for luxurious homes with exuberant facilities and features. The project is rightly located in serene locales off Kanakapura Road, Bangalore-South. This establishment advances over a vast envelope and offers urban styled apartments arrayed over high-rise towers set amidst beautifully landscaped outdoors. The project offers 2, 3 and 4 Bedroom apartments with plush interiors and exteriors. The apartments are drafted to be commodious, stylish and follow basic principles of vaastu. The presence of wide balconies and large windows pave way for fine ventilation. Each unit type be it small, medium or large, makes optimal utilization of available space and provides a comfortable dwelling for convenient living. Provident Equinox is located in expansive suburbs off Kanakapura Main Road, Bangalore. This Locale has excellent social and physical infrastructure in place, coupled with significant green coverage. The area is aided with reputed schools, colleges, grocery stores, hotels, hospitals, multiplexes, malls, banks and other civic amenities. The prime areas of the city like Electronic City, Bannerghatta Road, Mysore Road, Banashankari, JP Nagar and Jayanagar are in easy reach through the NICE corridor. 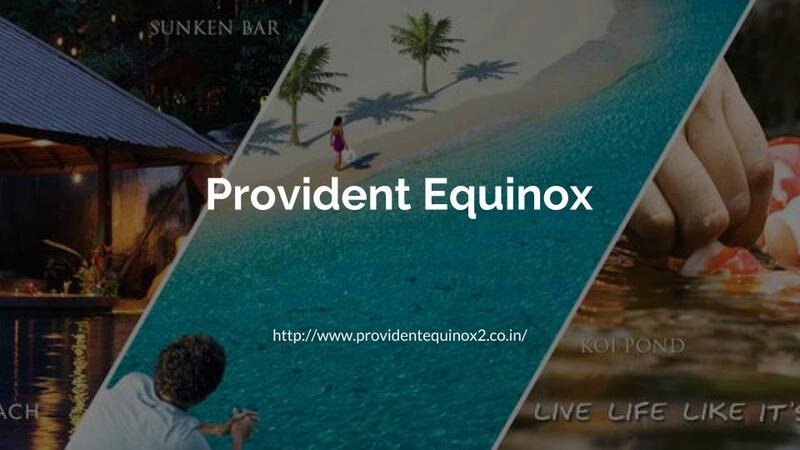 Provident Equinox Location : Judicial Layout, Kanakapura Road Bangalore South.